This tutorial will cover the NumPy random normal function (AKA, np.random.normal). If you’re doing any sort of statistics or data science in Python, you’ll often need to work with random numbers. And in particular, you’ll often need to work with normally distributed numbers. The NumPy random normal function generates a sample of numbers drawn from the normal distribution, otherwise called the Gaussian distribution. This tutorial will show you how the function works, and will show you how to use the function. If you’re a real beginner with NumPy, you might not entirely be familiar with it. With that in mind, let’s briefly review what NumPy is. NumPy is a module for the Python programming language that’s used for data science and scientific computing. Specifically, NumPy performs data manipulation on numerical data. It enables you to collect numeric data into a data structure, called the NumPy array. It also enables you to perform various computations and manipulations on NumPy arrays. Essentially, NumPy is a package for working with numeric data in Python. For more details about NumPy, check out our high level tutorial on NumPy, as well as our tutorial about the NumPy array. So NumPy is a package for working with numerical data. Where does np.random.normal fit in? As I mentioned previously, NumPy has a variety of tools for working with numerical data. In most cases, NumPy’s tools enable you to do one of two things: create numerical data (structured as a NumPy array), or perform some calculation on a NumPy array. The NumPy random normal function enables you to create a NumPy array that contains normally distributed data. Now that I’ve explained what the np.random.normal function does at a high level, let’s take a look at the syntax. The syntax of the NumPy random normal function is fairly straightforward. Note that in the following illustration and throughout this blog post, we will assume that you’ve imported NumPy with the following code: import numpy as np. That code will enable you to refer to NumPy as np. Let’s take a quick look at the syntax. Let me explain this. Typically, we will call the function with the name np.random.normal(). As I mentioned earlier, this assumes that we’ve imported NumPy with the code import numpy as np. Inside of the function, you’ll notice 3 parameters: loc, scale, and size. Let’s talk about each of those parameters. 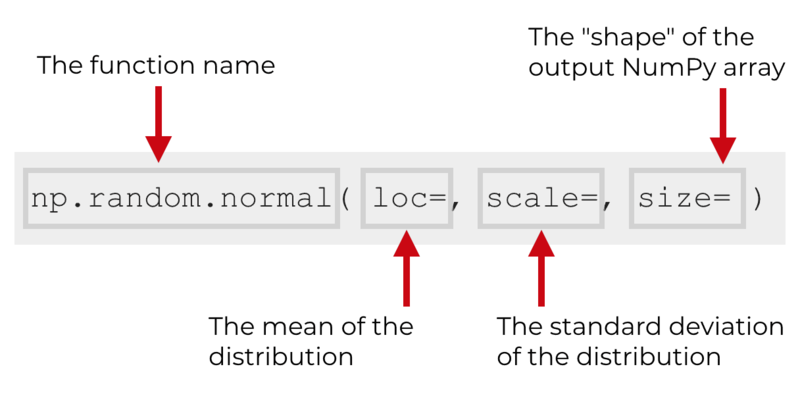 The np.random.normal function has three primary parameters that control the output: loc, scale, and size. I’ll explain each of those parameters separately. 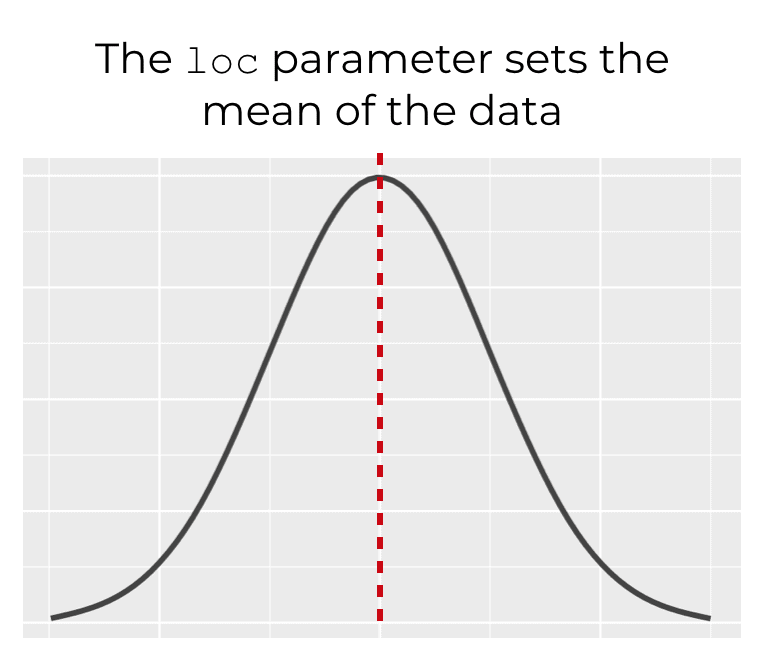 The loc parameter controls the mean of the function. This parameter defaults to 0, so if you don’t use this parameter to specify the mean of the distribution, the mean will be at 0. 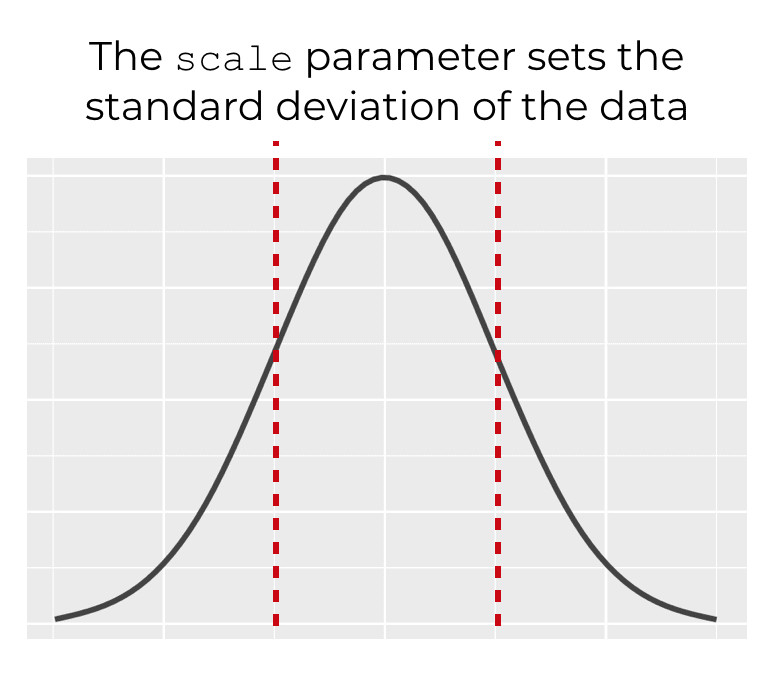 The scale parameter controls the standard deviation of the normal distribution. By default, the scale parameter is set to 1. The size parameter controls the size and shape of the output. Remember that the output will be a NumPy array. NumPy arrays can be 1-dimensional, 2-dimensional, or multi-dimensional (i.e., 2 or more). This might be confusing if you’re not really familiar with NumPy arrays. To learn more about NumPy array structure, I recommend that you read our tutorial on NumPy arrays. Having said that, here’s a quick explanation. The argument that you provide to the size parameter will dictate the size and shape of the output array. If you provide a single integer, x, np.random.normal will provide x random normal values in a 1-dimensional NumPy array. You can also specify a more complex output. For example, if you specify size = (2, 3), np.random.normal will produce a numpy array with 2 rows and 3 columns. It will be filled with numbers drawn from a random normal distribution. Keep in mind that you can create ouput arrays with more than 2 dimensions, but in the interest of simplicity, I will leave that to another tutorial. There’s another function that’s similar to np.random.normal. It’s called np.random.randn. Just like np.random.normal, the np.random.randn function produces numbers that are drawn from a normal distribution. The major difference is that np.random.randn is like a special case of np.random.normal. np.random.randn operates like np.random.normal with loc = 0 and scale = 1. Now that I’ve shown you the syntax the numpy random normal function, let’s take a look at some examples of how it works. I briefly explained this code at the beginning of the tutorial, but it’s important for the following examples, so I’ll explain it again. The code import numpy as np essentially imports the NumPy module into your working environment and enables you to call the functions from NumPy. If you don’t use the import statement to import NumPy, NumPy’s functions will be unavailable. Moreover, by importing NumPy as np, we’re giving the NumPy module a “nickname” of sorts. So we’ll be able to refer to NumPy as np when we call the NumPy functions. You probably understand this if you’ve worked with Python modules before, but if you’re really a beginner, it might be a little confusing. So, I wanted to quickly explain it. Ok, now let’s work with some examples. First, let’s take a look at a very simple example. 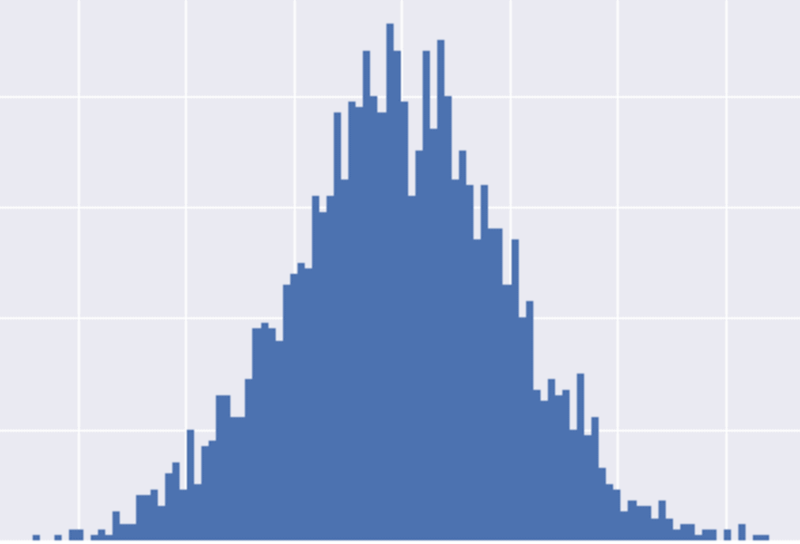 Here, we’re going to use np.random.normal to generate a single observation from the normal distribution. This code will generate a single number drawn from the normal distribution with a mean of 0 and a standard deviation of 1. Essentially, this code works the same as np.random.normal(size = 1, loc = 0, scale = 1). Remember, if we don’t specify values for the loc and scale parameters, they will default to loc = 0 and scale = 1. Now, let’s draw 5 numbers from the normal distribution. This code will look almost exactly the same as the code in the previous example. Here, the value 5 is the value that’s being passed to the size parameter. It essentially indicates that we want to produce a NumPy array of 5 values, drawn from the normal distribution. Note as well that because we have not explicitly specified values for loc and scale, they will default to loc = 0 and scale = 1. Now, we’ll create a 2-dimensional array of normally distributed values. To do this, we need to provide a tuple of values to the size parameter. So we’ve used the size parameter with the size = (2, 3). This has generated a 2-dimensional NumPy array with 6 values. This output array has 2 rows and 3 columns. To be clear, you can use the size parameter to create arrays with even higher dimensional shapes. Now, let’s generate normally distributed values with a specific mean. To do this, we’ll use the loc parameter. Recall from earlier in the tutorial that the loc parameter controls the mean of the distribution from which we draw the numbers with np.random.normal. Here, we’re going to set the mean of the data to 50 with the syntax loc = 50. You can see at a glance that these values are roughly centered around 50. If you were to calculate the average using the numpy mean function, you would see that the mean of the observations is in fact 50. Next, we’ll generate an array of values with a specific standard deviation. As noted earlier in the blog post, we can modify the standard deviation by using the scale parameter. In this example, we’ll generate 1000 values with a standard deviation of 100. Notice that we set size = 1000, so the code will generate 1000 values. I’ve only shown the first few values for the sake of brevity. If we round this up, it’s essentially 100. Notice that in this example, we have not used the loc parameter. Remember that by default, the loc parameter is set to loc = 0, so by default, this data is centered around 0. We could modify the loc parameter here as well, but for the sake of simplicity, I’ve left it at the default. Let’s do one more example to put all of the pieces together. Here, we’ll create an array of values with a mean of 50 and a standard deviation of 100. I won’t show the output of this operation …. I’ll leave it for you to run it yourself. Let’s quickly discuss the code. If you’ve read the previous examples in this tutorial, you should understand this. We’re defining the mean of the data with the loc parameter. The mean of the data is set to 50 with loc = 50. We’re defining the standard deviation of the data with the scale parameter. We’ve done that with the code scale = 100. The code size = 1000 indicates that we’re creating a NumPy array with 1000 values. That’s it. You can use the NumPy random normal function to create normally distributed data in Python. If you really want to master data science and analytics in Python though, you really need to learn more about NumPy. Here, we’ve covered the np.random.normal function, but NumPy has a large range of other functions. The np.random.normal function is just one piece of a much larger toolkit for data manipulation in Python. Having said that, if you want to be great at data science in Python, you’ll need to learn more about NumPy. Check out our other NumPy tutorials on things like how to create a numpy array, how to reshape a numpy array, how to create an array with all zeros, and many more. More broadly though, if you want to learn data science in Python, you should sign up for our email list. Here at Sharp Sight, we regularly post tutorials about a variety of data science topics. In particular, we regularly publish tutorials about NumPy. If you sign up for our email list, we will send our Python data science tutorials directly to your inbox.